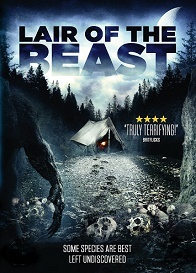 Lair of the Beast is released on DVD August 22. And to celebrate we have a great competition for you and 3 copies on DVD to give away. Four friends hike into the Pinewood forest to find evidence of the Chupacabra, a creature believed to be responsible for the disappearance of a group of experienced hikers a year earlier. As they journey deeper into the forest, they are introduced to a darkness that leaves these four victims fighting for their lives. One by one these friends are faced with the reality of survival. Who Directs Lair of the Beast?